At NW Endodontics, we welcome ALL new patients that want to visit our practice. If you have suffered a traumatic dental injury, please call us at (403) 239-3828 today. Some of the more common traumatic injuries are explored in-depth below. Treatment depends on the type, location, and severity of each injury. When any dental injury occurs, the most important thing is to see your dentist or endodontist immediately. The success and prognosis of treatment for your specific injury is often time sensitive. Most chipped teeth can be repaired by reattaching the broken piece or by placing a tooth-colored filling. 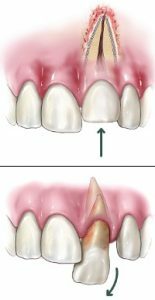 If a significant portion of the tooth crown is broken off, then an artificial crown or cap may be needed to restore the tooth. If the chip or fracture exposes the pulp of the tooth; root canal therapy is likely indicated. Injuries to the back teeth often include fractured cusps, cracked teeth, and the more serious split teeth. If the crack does not extend into the root, the tooth can usually be restored by your dentist with a full crown. 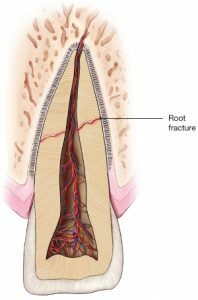 If the crack does extend into the root, root canal treatment and a full coverage crown may be needed to restore function to the tooth. Some severe fractures may splits the entire tooth and these will require an extraction. During an injury, a tooth may be pushed sideways, out or into its socket. Your endodontist or general dentist will reposition and stabilize your tooth. Root canal treatment is usually started within a few weeks of the injury and medication, such as calcium hydroxide, will be placed inside the tooth. Eventually, a permanent root canal filling will be placed. In young patients (under 15 years), root canal treatment may not be indicated for traumatized teeth due to incomplete root development. Your endodontist or general dentist will reposition and stabilize your tooth. These teeth are then be monitored carefully and intervention will occur when unfavorable changes are detected. If an injury causes a tooth to be completely knocked out of your mouth, time is of the essence! The tooth should be handled very gently, avoiding touching the root surface itself. Quickly rinse the tooth gently with water if it is dirty. DO NOT use soap or other cleaning agents. NEVER scrape or brush the tooth. If possible, place the tooth gently back into the socket. Keep the tooth moist, if you are unable to place it back into the socket. Cold Milk or Save-A-Tooth (available at your pharmacy) is the best storage solution. The less time the tooth is out of its socket, the better chance for saving it. Contact your dentist or Endodontist immediately, this tooth will need to be splinted for a few weeks. Root canal treatment will be started within a couple of weeks after re-plantation, with the exception of a tooth in a very young child. The length of time the tooth was out of the mouth and the way the tooth was handled will influence the chances of saving the tooth. Immediate treatment is essential. A traumatic injury to the tooth may result in a horizontal root fracture. After the diagnosis is made, the tooth will need to be re-positioned if it has been displaced followed by placing a splint for a few weeks. Properly treated, teeth with horizontal root fractures usually have a good prognosis.